Shop Locally! Think Downtown First! 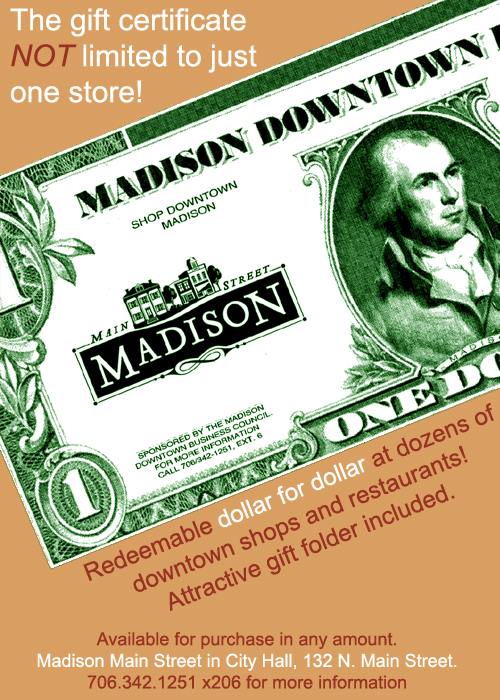 Downtown Dollars are gift certificates accepted at 50+ locations in Downtown Madison – including attractions, inns, restaurants, and shops. Ahead: To have them ready for pick up, call ahead to (706) 342-1251, extension 206 or email. Redemption: Participating businesses may print and complete this form to expedite processing when you bring dollars to the Main Street Office.